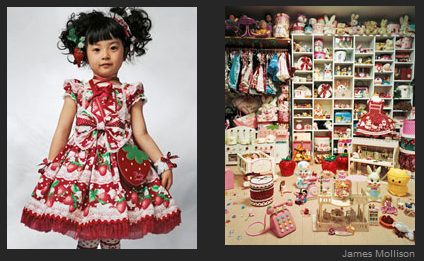 James Mollison wanted to portray children's diverse worlds. What better way to do so than to photograph their bedrooms? Overall, the gallery is a an eye-opener into the lives of children from all over the world and of various socioeconomic levels. While their sleeping environments reveal cultural and behavioral clues as well as how they're being raised, some of their faces (especially their eyes) tell us just how much they've endured so far. Some of these kids definitely warrant my empathy and compassion, specifically, the 14-yr. old girl who had to sleep on the cold hard floor for most of her pregnancy and the 4-yr. old Romanian boy who sleeps on a mattress outdoors, completely exposed to the elements, and even has to share it with his entire family. However, the rest of the portraits simply tell us just how different we all are from one another as humans, from family to family and from culture to culture. Have you ever heard of the saying "what you don't know won't hurt you?" or "ignorance is bliss"? If we don't know how much better life could be, we're probably perfectly happy with things the way they are. I'm sure the tribal girl portrayed is quite satisfied with living in a hut made out of cattle hide and plastic because everyone else she knows is living under the same conditions. How about the Cambodian boy who lives in a dump and the 7 yr. old Nepalese girl who works at a quarry? Do they know any better? They've been raised in that environment probably since birth and have adapted to it with no knowledge or expectation of our standard of luxury. If they don't know any better, can we assume they must be content? Children are also highly adaptive to their environments, more so than we give them credit for. I apologize that this post is not about food today. I just wanted to break away from food for once to share this stunning gallery with you because it serves to remind us that beyond our comfortable, luxury cars and homes, our shiny iPhones/iPads, brand name goods and gourmet dining experiences, we must never forget the simple things in life nor take them for granted...things like having basic hygiene, clean clothes on our backs, a warm nourishing meal, a roof over our heads and a soft bed to sleep in. Most importantly, let's not forget that our children are our treasure and the environments in which they're raised in, as well as how they're raised will shape what they will become in their later stages of life. Let them form their own lifelong goals and interests, develop their own personalities and just let them be kids.